How many pictures do you take during an event ? A very difficult question to answer because it depends on the day and the number of hours of coverage that I shall do, type of assignment, number of people around , weather conditions, light conditions and more. Every assignment is different but after a half day of typical work you would expect to have at least 100 images to chose from. What type of photography style do you do ? Depends on the assignment, but basically anything you like. When will your pictures be ready ? Depends on how large the assignment is and what we agree on when booking, but in general the images will be ready for digital review after one week. How will the images be delivered or presented ? Depends on the assignment but one way is a secure login to the client area to view your images online. What is a Bayer pattern ? The color filter used by most digital cameras to enable color photography using an image sensor [wikipedia]. 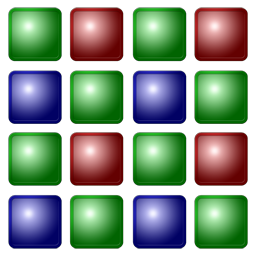 This pattern is placed on the sensor after the silicon is complete and created using only primary color (Red, Green and Blue) filter patches arranged in a grid. This pattern is optimized to ease demosaicing [wikipedia], which is the name for the process to interpolate the missing colors. Many different methods and algorithms exist to implement this, each method with its strengths and weaknesses. Most camera manufacturers and RAW-conversion-software developers don’t disclose their method. This color filter pattern was invented and patented 1976 by Bryce Bayer, working as a scientist for Estman Kodak . The pattern was first described in Bryce Bayer’s notebook (29th May, 1974) as a solution to provide color in a camera using a photo sensor array. Bayer passed away at the age of 83 the 13th November 2012 in Bath, Maine. This clever and still simple pattern mimics the human eye’s structure by using double amount of green pixels compared to blue and red. More information on the Bayer pattern filter can be found on [wikipedia].